Even our sweet and tangy skeptics just might open up for grilled portobello mushrooms with a slap of MIRACLE WHIP. Brush mushroom and pepper with reserved artichoke marinade. Grill 5 min. on each side, brushing with any remaining marinade for the last few minutes. Meanwhile, grill bread 1 to 2 min. on each side or until lightly toasted on both sides. Slice mushroom and pepper. Spread 1 toast slice with dressing; spread remaining toast slice with pesto. 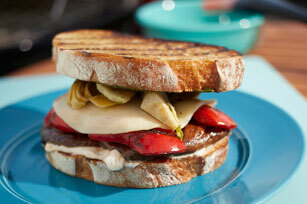 Fill toast slices with grilled vegetables, cheese and artichokes to make sandwich. Substitute KRAFT Zesty Italian Dressing for the reserved artichoke marinade. Vegetables can be grilled ahead of time; cool, then refrigerate up to 24 hours. Reheat in microwave before using as directed.